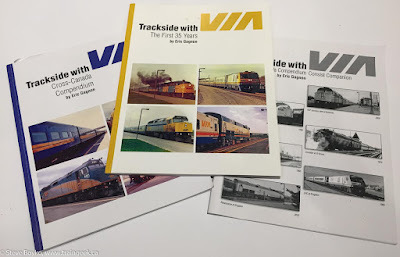 Confessions of a Train Geek: New VIA Rail Book! 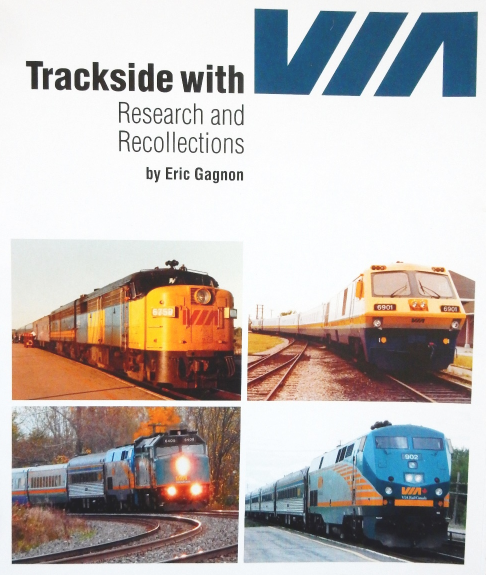 Noted VIA Rail expert Eric Gagnon has published a new VIA Rail book called "Trackside With VIA: Research and Recollections". This is the fourth book he's published and I think it's going to be a great one. Like Eric's other books, it's likely to be chock full of data, odd consists, and plenty of stuff you didn't know about VIA Rail. The official launch is Monday, April 24 but you can order your book now with this printable order form, or by sending an e-transfer to Eric's email listed at the top right corner of his site. The order form has the pricing, which is $35 for Canadian addresses, including postage, which is a good price in my opinion. I was the first e-transfer customer so I have been anxiously checking my mailbox for my own copy to join its three brothers? Sisters? What gender are books? You can read my review of Trackside with VIA: The First 35 Years or my 10 Questions for Eric Gagnon. I highly recommend you go buy the book if you have any interest in VIA Rail! Thanks for the shout-out, actually more like a yell-out (carries farther), Steve! Just the reason I need to give the highball to the new VIA Rail book blog and turn the background green! Hope yours arrives really soon!! You're welcome, Eric - I hope you sell out quickly! I'll be sure to let you know when my book arrives.